Wednesday, April 3, 7:30 p.m. This concert comes with a story. In May of 2010, three New York musicians piled their instruments and recording equipment into a plane for the 90 mile trip from Florida to Havana, Cuba. (That’s ninety miles: Pittsburgh, Cleveland and Buffalo are all further than that from Erie.) Arriving, they recruited a local rhythm section and spent a week recording their visit and their music for a BBC documentary. The musicians: award-winning vibist Stefon Harris (“Best Vibraphonist” in Downbeat, JazzTimes, Jazzis polls), Grammy-winning saxophonist David Sanchez, and Grammy nominee trumpeter Christian Scott, noted the extremely high level of musicianship among their Cuban compatriots, and the “steady diet of good music” on the Cuban scene. Two outstanding pianists/composers, Rember Dukarte and Harold Lopez-Nussa, helped integrate them with local musicians. With recordings in hand, and good will all around, the Americans left for the editing room. The documentary is “to be released soon.” Meanwhile, the trio has embarked on a tour celebrating the music they found and made. 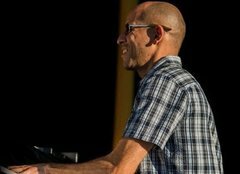 Rhythm personnel will include Venezuelan pianist/composer Edward Simon. Trumpeter Scott will be replaced by Nicholas Payton (no falloff in talent there!) The travel ban to Cuba has been eased since the time of their visit. More good music to come! During the 2012-13 season, Mercyhurst University’s Mary D’Angelo Performing Arts Center is giving Erie a panoply of great jazz performances. The third and final offering continues the tradition. The 2012-13 lineup, which was fashioned with hefty input from JazzErie’s Performance Committee and particularly Rob Hoff, who also serves on Mercyhurst’s faculty, has been stunning. 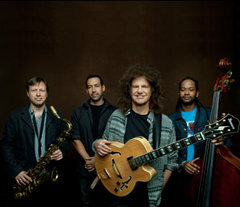 First up was the Pat Metheny Unity Band. If you were among the large crowd who showed up for this event in September, you know what an outstanding performance it was. Highest level of musicianship from Metheny, Chris Potter Ben Williams and Antonio Sanchez; powerful, innovative music. License plates from Ohio, Ontario, New York and farther afield testified to these great musicians’ drawing power. 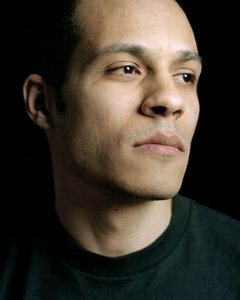 Then, on Friday, January 18, 2013, at 8 p.m., Gregoire Maret came to the Mary D’Angelo Center. Maret is a contemporary jazz harmonica great (words not usually seen together.) But listen to Herbie Hancock’s rave: “There’s no one else out there that comes close on the harmonica and he rivals the best on any instrument. He’s one of the most creative musicians around.” Add raves from Metheny and Marcus Miller. And Cassandra Wilson has chosen him as her music director. And of course his French matinee idol looks don’t hurt. Still better known in Europe than in the States, he’s on a rapid rise to stardom. On Tuesday, April 2, 2013, at 7:30 p.m., the Ninety Miles Project will complete the season. A terrific collection of wide-ranging talents. Score one for collaboration. JazzErie Members get $3 off on tickets, and the pleasure of top talent.